We are used to thinking low compression golf balls while having a softer feel didn’t go as far as those with a firmer feel. Ladies and seniors played the lower compression models since they couldn’t get the distance benefits of high compression golf balls due to their slower swing speeds. Since the introduction of multi-layer solid core balls like the Titleist ProV1 the spread of performance has widened but everyone acknowledged it would be nice to add the softer feel of low compression golf balls to the distance gains of solid core construction. Building a ball with a very soft core meant, especially with longer clubs, though the spin rate was lower the core didn’t react fast enough to produce distance. According to Callaway that was true until now. The 3-piece Chrome Soft is billed to have a soft feel and still produce the distance, high ball speed and low spin with their aptly named “SoftFast Core” and a urethane cover. During February and March I took them to the course for an extended trial and as it turned out, though my northern friends were envious, played them in four southern states for a total 16 rounds. The answer is the Chrome Softs were long, certainly comparable to every other golf ball model including the Titleist’s Pro V1 we have reviewed and certainly within the variability inherent in my very average swing. Coincidentally, we received unsolicited samples from another manufacturer of a “distance and feel” ball and took them along with the Callaway’s on a trip to Georgia. No contest, the “distance and feel” ball didn’t have anywhere near the “distance” of the Chrome Soft and the “feel” around the greens was like a rock while the Chrome Soft showed control properties we really appreciated. The comments from friends to whom I gave sample sleeves (usually two sleeves so they would have an extended opportunity to make their evaluation) were positive and two of them said they liked the Chrome Soft so much in comparison to their usual brand they would be switching. Negatives. On some downwind shots, particularly with a driver, it seemed as though the Chrome Soft though hit well, fell out of the air very quickly. Admittedly this is a subjective impression but it happened on more than one occasion. Unfortunately in each case when that happened circumstances were such it wasn’t possible to hit additional tee shots so this remains an impression only worth mentioning in passing. 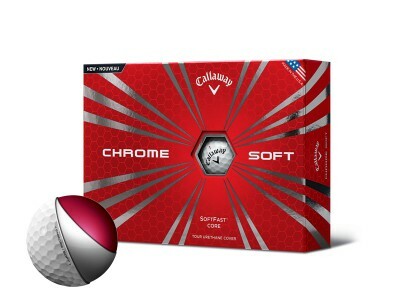 Secondly some may object to the price but at $38 dozen the Chrome Soft are $10 less than market leader ProV1 and $7 less than the Bridgestone B330-RX series. Recommendation. 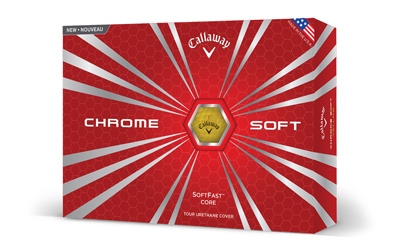 The Callaway Chrome Soft is really worth trying and I believe you will be happy with the results. Tried the callaway chrome soft last year, 2015, and was pleasantly surprised. Low spin off the driver, very accurate, and very good distance, but plenty of check on the greens with wedges. I truly hope the 2016 “New, and Improved” chrome soft are as good. If not, will be going back to my old ball previously played..